Summer picnics are a great way to get outdoors and spend quality time with the family. So why not feed the ones you love quality food? Below are healthy recipes created by Elizabeth Somer, MA and RD. These easy recipes are perfect for summer picnics and they’re enhanced with DHA, the omega-3 fatty acid that supports brain health at all ages. Spray 10-inch tart pan with cooking spray. Unfold piecrust into tart pan. Gently press dough to cover bottom and sides of pan. Bake for 10 minutes, or until crust is light brown. Remove from oven. Set aside. Reduce oven temperature to 350 degree. In a large, non-stick skillet, heat olive oil over medium heat. Add onions, leeks, salt and pepper. Sauté for about 10 minutes, stirring occasionally until golden brown. Add balsamic vinegar and brown sugar. Stir well, then spoon caramelized onion mixture evenly on the bottom of tart crust. Add crumbled blue cheese to cover onion mixture. Set aside. In a medium bowl, whisk together eggs, half & half, and thyme. Pour into tart pan. 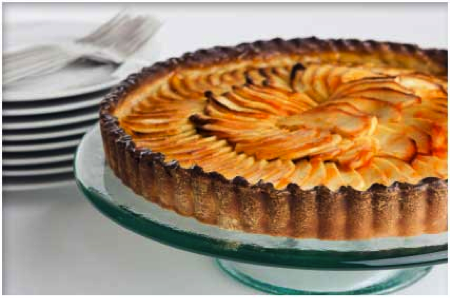 Place sliced apples on top of tart mixture, starting along outer edge and working towards center of tart in a circular pattern. Overlap apples where needed. Continue layering apples until tart surface is covered with apples. Sprinkle with nutmeg. Bake for 25 minutes, or until center of tart is firm. Cool for 5 minutes. Serve warm or at room temperature. Makes 8 servings. Rinse, pat dry fish fillets. Set aside. In a small bowl, whisk together lime juice, lemon juice, Creole seasoning, and oil. Spoon marinade on fish fillets to coat. Cover, place in refrigerator until ready to grill (up to 1 hour). In a medium bowl, add prepared coleslaw mix. Set aside. In a small bowl, whisk together sour cream, mayonnaise, chipotle peppers, lemon juice, and cilantro. Pour over coleslaw mix. Toss well to combine. Cover and refrigerate until ready to use (up to 1 hour). Spray grill with cooking spray. Heat grill to medium-high. Remove fish fillets from marinade. Place on grill. Cover lid and cook 3 minutes on each side, or until no longer opaque in center. Remove from grill. Separate fish into 2-inch chunks with a fork. Cover to keep warm. To assemble: Set up buffet style. Let everyone make their own fajitas. 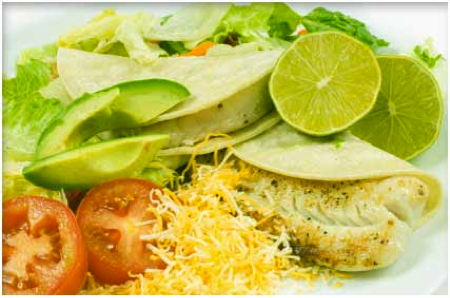 Place grilled fish on a plate, next to warm tortillas, coleslaw, and sliced mango. Spoon several pieces of grilled fish on bottom end of tortillas, cover with coleslaw, add mango slices. Fold over, roll up, and eat. Makes 8 fajitas.